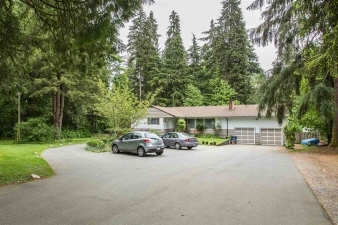 Description: Rare opportunity .65 acre parcel, backing onto hyde creek protected greenspace, steps to poco trail, immediate development potential. Site would likely support 3 lot subdivision under current rs1 zoning w/rar rpt confirming 15m setback is supported. See realtor remark for link to prof proposal & site analysis. Currently solid 3100sf home. 4 bdrms up incl nanny accommodations. Fully finished bsmt w/wheelchair access, easy suite potential/ 2 bdrms plus lrg recrm/common area, 3 baths incl handicap equipped bathroom. Remarkable site, w/veggie garden, wine grapes, fruit trees, blackberries, 20x20 storage shed, covered picnic/bbq area w/fully fenced yard! Extremely rare opportunity, country lifestyle in the city!! Buy, hold & enjoy or buy & dev now! Open house sep 8 & 9 2:00-4:00 pm.